Since the amateur radio F-1 CubeSat was deployed from the International Space Station (ISS) on October 4 there have been no confirmed reception reports. The attempts to recover the CubeSat are now focusing on reception of the backup UHF FM channel 437.485 MHz (+/-10 kHz Doppler shift). This FM beacon should transmit Morse Code for 20 seconds every 80 seconds during daylight. The amateur radio CubeSat F-1 built by students at the FPT University in Hanoi, Vietnam has now been delivered to the Tsukuba Space Center in Japan. F-1 and the other four CubeSats (RAIKO, WE WISH, FITSAT-1 and TechEdSat) will be integrated with the small satellite deployer J-SSOD before leaving for Tanegashima launch pad. The CubeSats should be launched to the International Space Station (ISS) on July 21 in the HTV-3 cargo vessel. It is planned that they will be deployed from the ISS in September by Japanese astronaut Akihiko Hoshide KE5DNI using the Kibo robot arm. F-1 carries a low-resolution camera (640×480), a 3-axis magnetometer and two Yaesu VX-3R transceivers using 145.980 and 437.485 MHz. Since 1957, with more than 50 years of exploring space, the lower thermosphere (90-320 km) is the least explored layer of the atmosphere. Satellites and space stations usually orbit at altitude over 320km (to increase orbital lifetime) Atmospheric Explorers were flown in the past in highly elliptical orbits (typically: 200 km perigee, 3000 km apogee); they carried experiments for in-situ measurements but the time spent in the region of interest below 320 km was only a few tens of minutes. Nowadays, sounding rocket flights provide the only in-situ measurements. While they do explore the whole lower thermosphere, the time spent in this region is rather short (a few minutes), there are only a few flights per year and they only provide measurements along a single column. Powerful remote-sensing instruments on board Earth observation satellites in higher orbits (600–800 km) receive the backscattered signals from atmospheric constituents at various altitudes. While this is an excellent tool for exploring the lower layers of the atmosphere up to about 100 km, it is not ideally suited for exploring the lower thermosphere because there the atmosphere is so rarefied that the return signal is weak. The same holds for remote-sensing observations from the ground with lidars and radars. 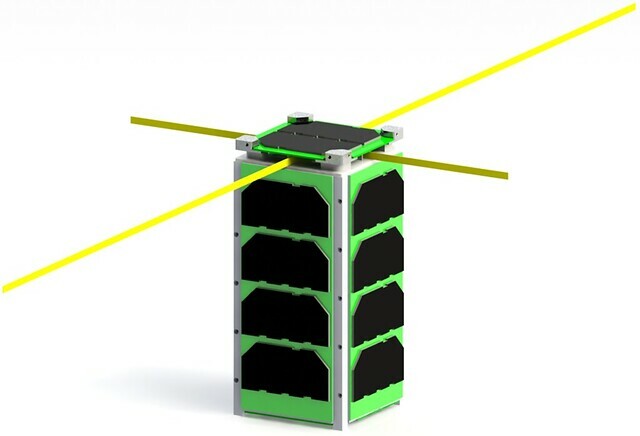 QB50 is an international network of 50 CubeSats for multi-point, in-situ measurements in the lower thermosphere and re-entry research proposed by the von Karman Institute. It has the scientific objective to study in situ the temporal and spatial variations of a number of key constituents and parameters in the lower thermosphere (90-320 km) with a network of 50 double CubeSats, separated by a few hundred kilometres and carrying identical sensors. QB50 will also study the re-entry process by measuring a number of key parameters during re-entry and by comparing predicted and actual CubeSat trajectories and orbital lifetimes. The multi-point, in-situ measurements of QB50 will be complementary to the remote-sensing observations by the instruments on Earth observation satellites and the remote-sensing observations from the ground with lidars and radars. All atmospheric models, and ultimately thousands of users of these models, will benefit from the measurements obtained by QB50 in the lower thermosphere. Collect scientific data of the lower thermosphere (from 330km down to 90km). Demonstrate practical application of CubeSats, especially in a constellation of 50 CubeSats and a network of multiple ground stations around the world. 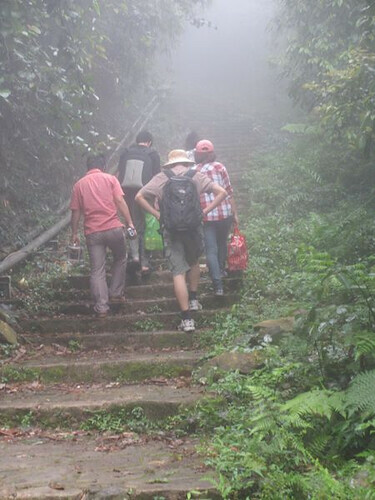 Besides these goals, F-2 project also has strong educational objectives such as providing hands-on-project experience on a space project to engineering/science students and promoting international cooperation/capacity building among universities around the world. Thu XV9AA successfully completed on ground long range communication tests with the F-1 bird. The project team is now undergoing the cubesat safety review to confirm its launch by an HTV cargo in late July. Successful long range communication test from 50km! FSpace team has just completed another important milestone by successful performed the long range communication test of F-1 CubeSat to the ground station at a distance of 50km! 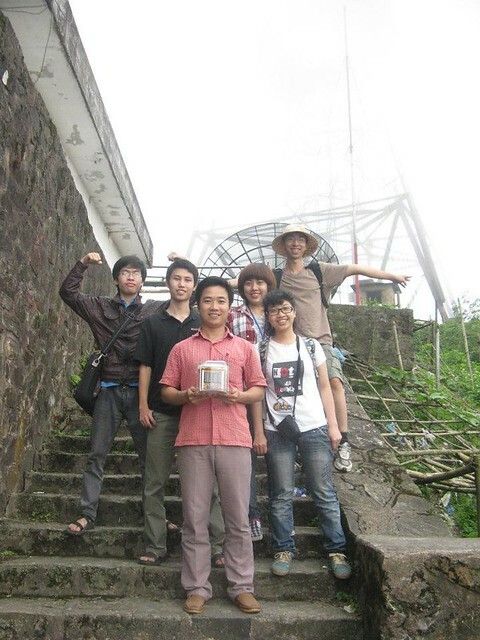 The team carried the little satellite to top of Tam Dao mountain (about 1300m high), more than 50km from the ground station at FPT building in Hanoi. 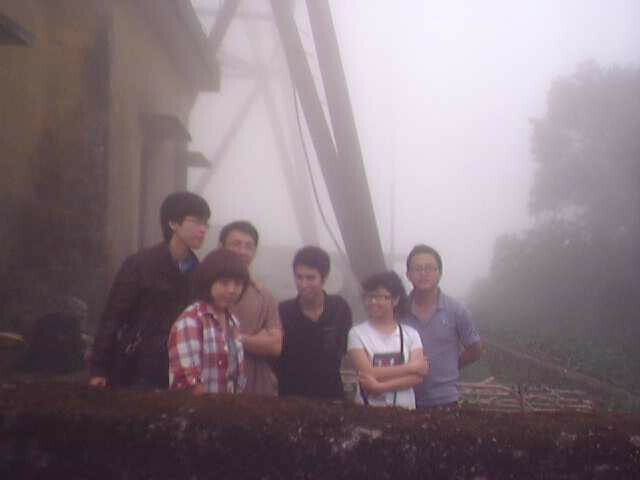 Despite of heavy fog and high humidity (which was very bad for radio communication) the ground station successfully sent uplink commands to F-1 and the satellite responded correspondingly, reporting its status and taking some photos. Test successful, let’s have a group photo!